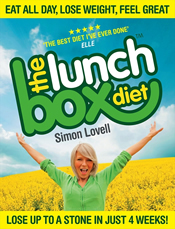 The Lunch Box Diet was created by Simon Lovell, a personal trainer, and is based on the diet that he claims he has used with great success with his clients. It has recently been featured in Elle magazine which described the diet as “set to become the biggest slimming craze of 2008”. Update: The Lunch Box Diet has been updated for 2010, see below for updated details. The Lunch Box Diet is based around the concept of filling a lunch box with healthy foods and grazing on the contents during the day. Simon recommends snacking every hour or so, only until satisfied, and never eating until full. Breakfast and dinner are taken as normal however some general suggestions are given for healthy meals. Simon claims that by eating food in smaller portion sizes the stomach will gradually become smaller so that you will be less likely to overeat at dinner. The focus of the diet is on the lunch box which should include around 60% vegetables, 30% protein and 10% salad dressing / condiments. Top recommended foods include – Broccoli, Spinach, Avocado, Chili Pepper, Sugarsnap Peas, Zucchini, Asparagus, Beetroot. Chicken or turkey breast, cod fish and balsamic vinegar. The book provides a more comprehensive list of food choices. Foods that are high in carbohydrates such as brown rice, wholegrain breads and pasta are only recommended for people who have a physically active lifestyle. Fruit is also recommended in moderation (a few pieces daily). Examples are given in the Lunch Box Diet book of how to construct the lunch box however there are no precise recommendations for portion sizes or calorie measurement. This is a great diet for people who don’t like counting calories, meal planning and preparation or complicated plans. Good for people who like snacking. The Lunch Box diet plan is very flexible, allows for much personal choice and is easily adapted to suit individual needs. The lunch box is high in low glycemic index foods which will help to keep energy levels stable during the most demanding part of the day. It would also produce benefits for health for those that are in the habit of skipping lunch or eating convenience food while at work. This is the time of day when stress may impact on choices negatively and unhealthy foods are often selected for a quick energy boost. Expensive for the size of the book and information provided. No guidance in regard to portion control. Calorie intake could easily become excessive especially if food intake at breakfast and dinner is not controlled. On the whole The Lunch Box Diet could be suitable for people who are just getting started with dieting and don’t want anything too complicated. It would be a good introduction to learn how to create healthy balanced meals and to increase vegetable intake. 3 Months of one on one email coaching. Dieters can try the out the lunch box diet for 21 days for just 4.95 pounds. this DIET seems simple! like an everyday thing! its good to have it in ur lunch box everyday! at least it helps! im in school and want too lose waight! i am very photogenic and have gotten many modelin contracks! but i need to lose waight by this summer and dont know what to do!!! not quite sure how much of each food group to put into my lunch box? 60% vegetables, 30% protein and 10% salad dressing / condiments.